At Adler & Allan, innovation is at the heart of our business. When it comes to flood mitigation, we understand that technology moves on so we actively seek out the most innovative and effective products and services to enable us to deliver the most effective 360º flood solution. All products supplied and recommended by Adler & Allan undergo rigorous testing at our Technical Innovation Centre in Oxfordshire. Our team of experienced flood engineers ensure that all products exceed the Kite mark standards set by BSI, so we can be assured that when a flood happens, our solutions will work for you and protect your business. Case studies and technical specifications are great, but sometimes things have to be seen to be believed. 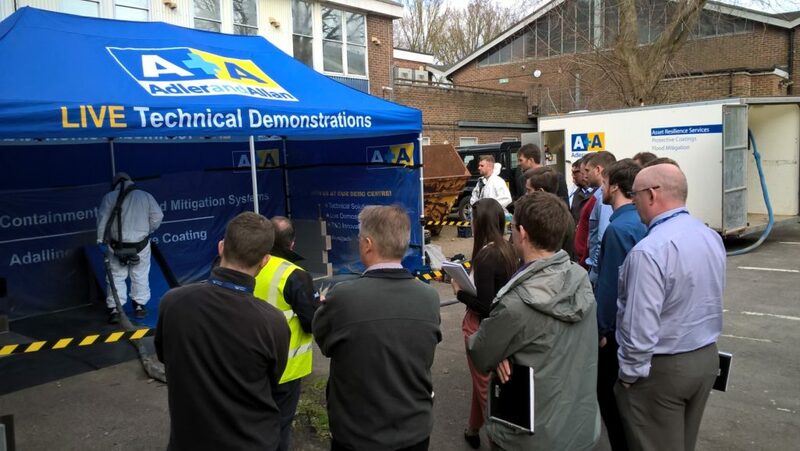 Held at our Technical Innovation Centre in Eynsham, we hold multiple demonstration days each year, allowing visitors to experience a selection of our innovations in practice. Our purpose built mobile demo trailer allows us to make personalised visits to organisations interested in our flood solutions. This enables us to provide bespoke advice and guidance during each session to help you find the right solutions for your specific challenges. If you and your colleagues would like to book a visit from our team of flood experts, simply fill in the form below and we’ll get back to you as soon as possible. For more information about our next Technical Innovation Day at Brize Norton, Oxfordshire, contact us.